Word to your mothers. Sleepy Hollow is back and it's giving me all kinds of great feelings. Last year I wrote a post explaining the reasons you should totally be watching Sleepy Hollow, which you should read if you're not into this awesome show. Anyway, the image above is another example of why you should be setting your peepers on this televisual spectacle. Without spoiling too much (maybe a little), that there is war. 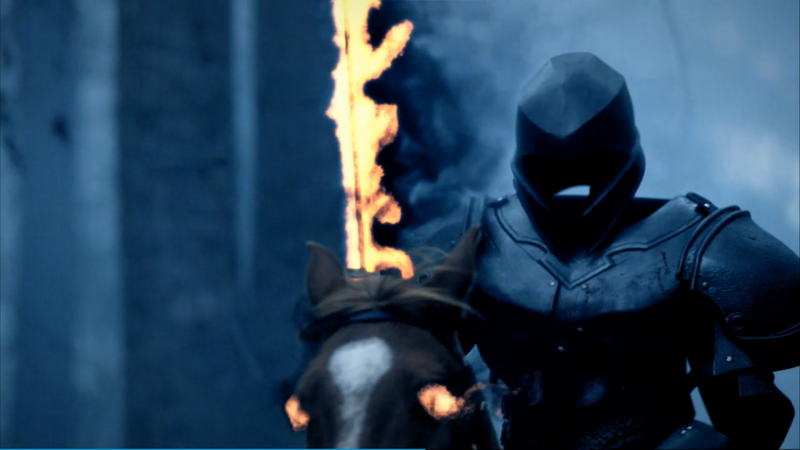 Notice how it is a SUIT OF ARMOUR WITH A FLAMING SWORD RIDING ON THE BACK OF A HORSE WITH FLAMING EYES. It is also an avatar controlled by a powerful magic-user who CAN EAT SINS. Also, in one scene Abbie Mills is attacking this guy with a shotgun. I cannot express how cool a show is when there's a scene of this insane magnitude. Also, Abbie Mills is the perfect woman. Oh my glob. Guys, you should be watching the hell out of this. Pun intended. Which is the king of gamebooks?